Quilted Photo Frame Set Discounts Apply ! This photo frame has twice the cuteness! The frames fit your favorite 3 1/2 x 5 photos to perk up any room or office. Make great gifts! Baby Boy Quilt Photo Frame. A baby bootie and rubber ducky are a few of the favorite playthings that will keep your little man company in this frame. 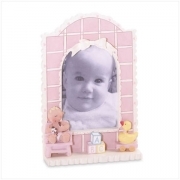 Baby Girl Quilt Photo Frame. Ribbons and a quilted pink heart pattern is just what your little girl needs to look especially cute! Both frames are made of Alabastrite, and measure 5" x 1 1/2" x 7 1/2" high. Mix and match sets of one, two, three or four frames so that you have enough to share!